Our child and family case management software supports whole-person care with case management functionality that simplifies administrative tasks and coordination of services. With our family health case management technology, case managers and social workers have a complete view of family case records. Our solutions manage foster, kinship and adoption home information, and provide data collection and reporting features to track placement stability and home compliance. Our CFS case management software helps your organization collaborate and integrate care with other providers. Real-time clinical management, billing and reporting help you deliver the full benefits of evidence-based practices, such as Multisystemic Therapy™. Our purpose-built child and family case management software simplifies care delivery as well as complex administrative tasks, such as reporting, billing and claims. As a result, you and your staff can focus on your mission to provide families and children with the services they need to remain safe, happy and healthy. Child and family service agencies, who adopt the right type of technology, such as an electronic health record (EHR) solution, with the right partner, can reduce their burden of overseeing the complexities of the process. 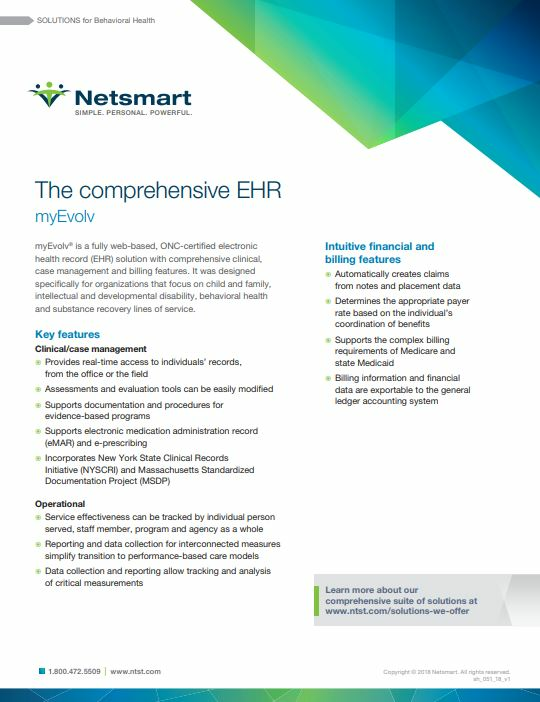 Read the paper to determine how well your EHR system supports referral management, intake and admissions, service planning and delivery, and information sharing. "We’ve always focused on improving children’s health outcomes. We accept the tremendous responsibility to address the most clinically and medically complex issues children may be facing."